KAVRE, June 28: Plant protection officers have started providing e-services to farmers in Kavre district. “We are upgrading plant clinic, which we started some years ago, into e-Plant Clinic by making optimum use of information technology,” Devraj Adhikari, the plant doctor of Kavre, told Republica. Adhikari has been running e-plant clinic in Panchkhal and Nala villages of Kavre district once a month. Both the villages are famous for potato farming. He has also been operating mobile e-plant clinics in other parts of the district when needed. “Fourteen farmers benefited from the clinic in Panchkhal yesterday. I provided solution to 23 problems related to chilly, maize, tomato and paddy crops,” Adhikari added. The plant clinic at Panchkhal has been in operation for the past two years. It was upgraded to e-plant clinic only five months ago. The number of plant clinics in Kavre has reached five. 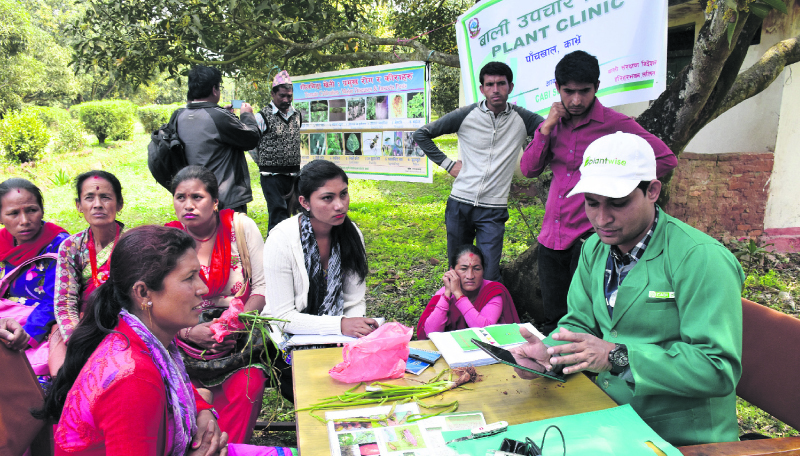 Adhikari has fed 120 types of data related to pests and diseases to Plant Clinic Online Data Management System (PMOS). “Those who cannot visit the clinic post photographs of their plants on my Facebook Messenger. I respond to them accordingly,” he added. The Plant Protection Directorate (PPD) under the Department of Agriculture has implemented e-plant clinic program to take the knowledge of plant doctors to the farmers by using information technology. The clinic was first started as pilot project in Lamjung in 2008. The clinic is being implemented by the Plant Protection Directorate with the support of Centre for Agriculture and Biosciences International (CABI). The details about pests have been made available in an application as knowledge bank by plantwise.org. Plant doctors diagnose the disease based on the knowledge bank and recommend remedies to farmers. The directorate has trained a total of 42 plant protection officers have been trained to operate e-plant clinics and update the PMOS database. Binod Pandit, coordinator of CABI, Nepal, said that they have developed a system through which CABI and the directorate can monitor whether or not plant doctors are giving correct recommendations for pest control.